It’s another WPT Bellagio Five Diamond title for the Pacific Northwest as Coeur D’Alene-based Dylan Linde took the title with a cash that nearly doubled his already-impressive earnings. Bend’s Seth Davies struck big at Bellagio, too, with a 3rd place in the 47-entry Event #2 $25K NLHEand a win four days later in Event #28 $25K NLHE (50 entries). Over at the Venetian, Scott Clements won Event #15 $150K GTD NLHE, with 576 entries. And last, but not least, Lake Oswego’s Max Brown got 4th in the Run It Up Stones $100K GTD NLHE Main Event, at Stones Gambling Hall outside Sacramento. I did manage to get a win at Final Table last Friday, so my target is a wee bit closer, but the opportunities are pretty slim at this point. 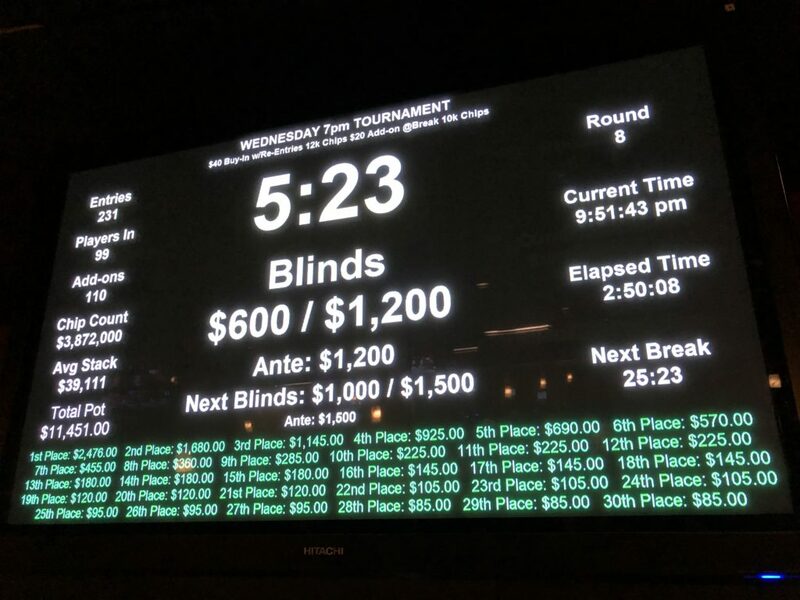 Picked up another little cash online at Ignition Casino Sunday night; missed in PLO8 Monday at Claudia’s and busted not even close to the money at the huge $4K at Portland Meadows on Wednesday. I’m heading down to Las Vegas on the 29th for the Venetian $260K GTD NLHE, last bit game of the year. The last event (ever) on my calendar is the Venetian Deepstacks Extravaganza V. Which starts today. There’s a $100K GTD the first weekend, and a $260K GTD Monster Stack just before the New Year’s ($400 buyin). This Sunday is the Muckleshoot Casino NLHE Deepstack ($300 buyin), with the $3K Added NLHE 5th Sunday ($400) coming up on the 30th. Both start at 10:15am. The Tulalip Casino $10K Added NLHE is $220 for entry (with $10 dealer add-on) on Sunday, 30 December, at 11am. They still don’t have the schedule for next month’s Pow Wow on their poker room page. I hate casino web sites. Headed out to the Portland Meadows $4K GTD. Turnout was, uh, good,with more than $11K in the prize pool after all the entries and addons had been tallied. Kind of sparse down there at the bottom if you were in for several buyins (see Why Not Rebuy?) Oh, yeah, I rebought, but just once—I’m more or less out of this poker thing in two weeks! Lost on a nut flush draw on the first buyin, then got lucky on the second and beat queens with jacks when I his a set on the turn and knocked out a newplayer who’d been all in twice on his first orbit at the table with 50bb and squeezed (with the queens) to my button 3-bet. I went out after the break by shoving into top pair’s large c-bet on a K♠T♥8♠ board with the open-ended Broadway draw. A shorter stack behind me shoved with the nut flush and got there, taking most of my stack, the rest went to top pair. Played about 40 minutes of tournament-subsidized $1/$2 Big O and busted two buyins. I’m going to have to talk to Jeremy Harkin about my last hand. Lost an Ignition Casino NLHE Jackpot Sit-n-Go. A non-poker colleague was passing through town; I headed over to play some pool. Got back, got a 5x payout and got rivered; out in 3rd. 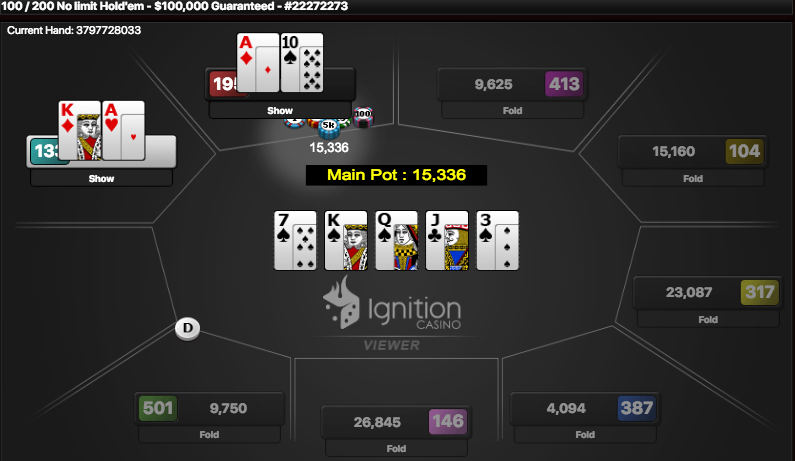 I got to the final table of the Ignition Casino $5K GTD NLHE with the chip lead but wasn’t able to maintain it. 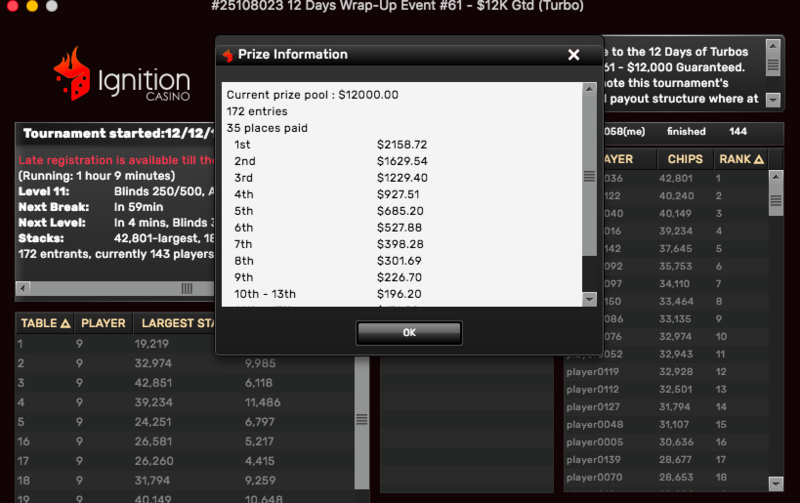 Still, 5th-place in a 525-entry tournament isn’t such a bad way to end the weekend. Monday night, I headed over to Claudia’s PLO8, made it through the break with a rebuy but busted out early. Did get a chance to talk briefly with Joe Brandenburg! Played the 0.5/0.5 NLHE for about an hour, won—I think—one hand, then managed to shove my last chips in against a hand that dominated me. Some people play cash games to subsidize their tournaments; apparently I play tournaments to subsidize my cash game. Got back home, jumped into the Ignition Casino $1K GTD NLHE 6-Max Turbo with 20bb and busted in less than 10 minutes. Played 2 NLHE Jackpot Sit-n-Gos, handily won the first but missed out on the second, which had a 4x payout. I don’t typically play the big Sunday tournaments on Ignition Casino, because of our evening family dinner and the preparations thereof, but I was up early and really, how many more Sundays are there this year? So I got into a $100K GTD NLHE Satellite with two other players and got about 10 minutes in before my trap was sprung on myself and my rivered two pair was beat by a better two pair made on the turn. 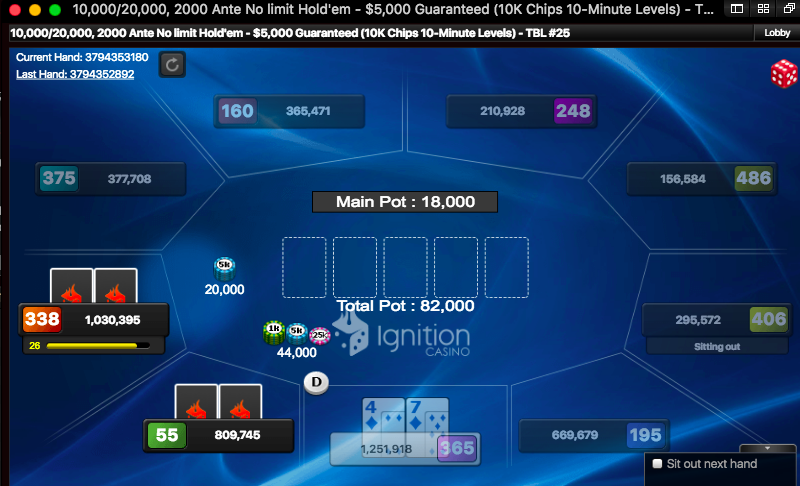 At midnight, down to the last two tables in a 525-entry Ignition Casino $5K GTD NLHE. Well, that went better than I expected. At this time last night, we were down to three tables at the Final Table $10K GTD NLHE, one of the last weekend events I’m going to get to play before my self-imposed retirement from poker goes into effect in 1 January. Just for some perspective, I’ve played 28 $10K GTD or larger events at Final Table alone this year, more than 2-1/2 workweeks of my spare time. Overall, including live and online, more than 15 40-hour weeks of my time playing poker. Hardly a full-time job, but quarter-time, anyway. 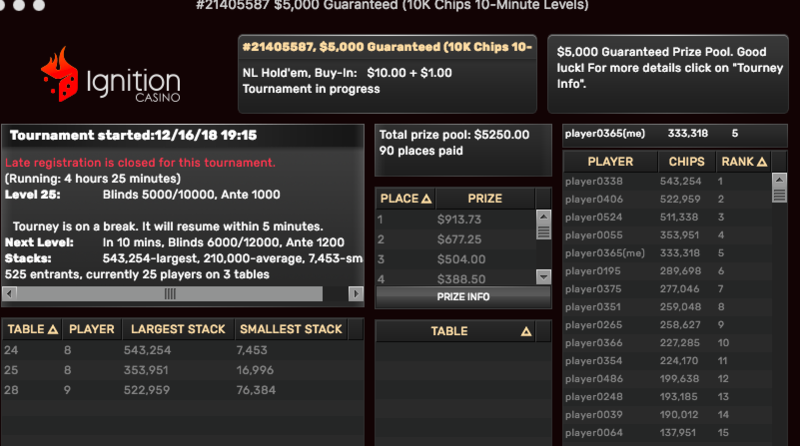 Anyway, I was in for just a single buyin and an addon last night, but I was a little short on chips as we maneuvered through the last ten or so players to the bubble. I had to make a couple of risky shoves (one with Q♣8♣ UTG) to stay alive long enough to make the 10 scheduled payouts. 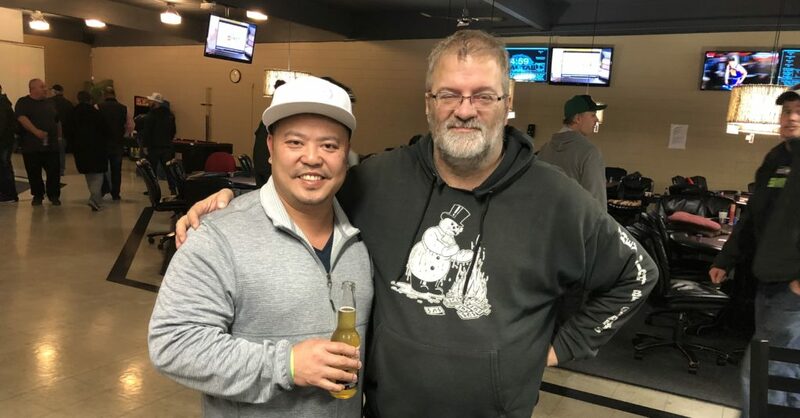 I had a pleasant chat with Paul, one of the local dealers-turned-pros about his ability to go up to British Columbia to play on PokerStars (which I envy). A Seattle player in Seahawks gear (natch) with a big stack sat on my left keeping things real by playing most of the hands down to the bubble. It took about an hour to go from 15 players to the final table. Three bubbles were proposed and then two bubbles, and almost immediately a couple of players went out and the first was paid (only $100 each, though). I was one of the three shortest stacks at the 10-handed final. I got the prime position in seat 1 (where the button started) so with the big blind ante I wasn’t paying anything for nearly 20 minutes. We were an hour into the final when things started to shift. Paul was now on my immediate left. The big stack was on the other side of the dealer in seat 10. Two players had busted out, I’d picked up a few chips and was just over 200K, but that was still 10bb, and with the big blind ante, you’re losing a fifth of that in one whack. Anyway, seat 8 was UTG and he raised from one of the other short stacks to 55K. Seahawks guy had over 600K and called—he’d been making good use of suited connectors all night. I had AxQx and I shoved, hoping that I had enough to get the big stack to fold when it came back around. paul shoved behind me with a bit more. After a long moment considering, the original raiser called all in, then the big stack bowed out and it was tens for the original raiser against kings for Paul and an ace hit the flop, essentially tripling me up to the chip lead or very near. Between us, the big stack and I had two-thirds of the chips in play, and I cruised along for a while with a couple more eliminations until I raised Seahawks’s big blind and he shoved into my AxKx with K♦2♦. Which I called. It was over pretty soon after that, the other two players (including Ron S., who’d been my only railer when I took 3rd this February at Chinook) had a total of 25% of the chips and I had the other 75%. It was 4:30am and we were all amicable so I kicked back $290, the other guys split that along with 2nd and 3rd money for about $2Keach, and I got $3K straight up. Better than the ICM. I had been thinking that if I got down to this point I was going to play it out no matter the consequences, and after all the 3-person Sit-n-Gos I’ve been playing on Ignition, I’m pretty sure I could have maintained by first-place, but I wanted to get home and see if I could come up with some other options for my quest for $100K. One was the Bay 101 Shooting Star Satellite this morning. While the tournament itself isn’t until March (and it isn’t a WPT event this time around), I figured if I won the seat before the end of the year it wouldn’t violate my self-conditions. It was at 9am in San ose. 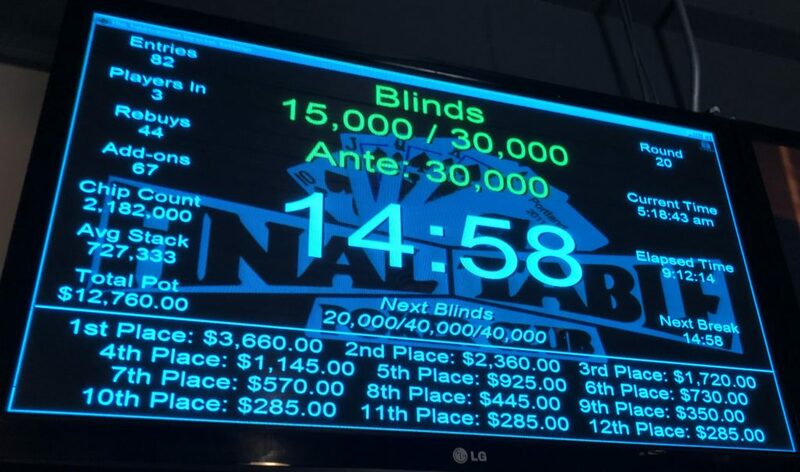 The Bicycle Casino had two flights to a Quantum $250K GTD NLHE tournament at 11:30am and 4pm. And, of course, there was the Venetian/CPPT $500K GTD NLHE with a $3500 buyin if I wanted to emulate the path I took after my first $10K 1st place at Encore Club back in 2011. The flights, though, were killer. 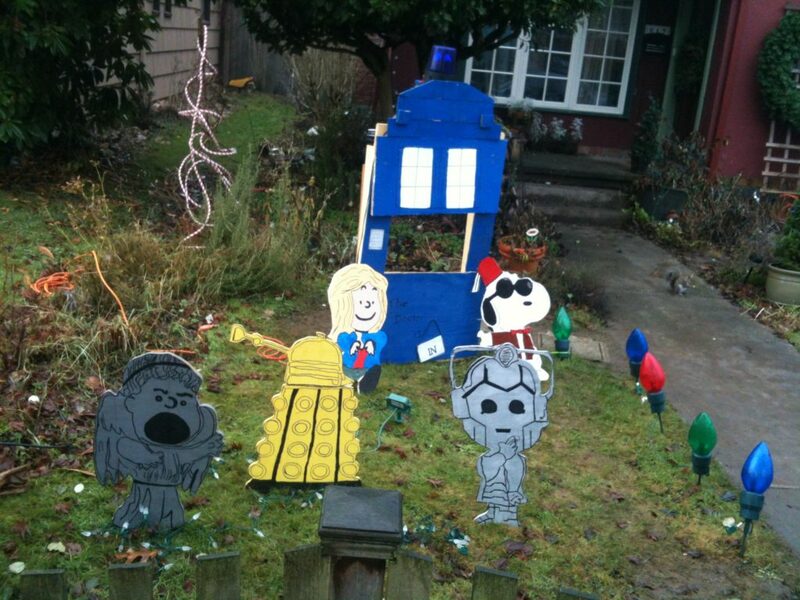 This far into the holiday season, with short notice, everything is hideously expensive. I didn’t want to blow it all (and more) on a one-shot at the Venetian, getting to San Jose in time was just not happening by the time I got home, and trying to make the first flight at LA was pretty awful, too. Unfortunately, even the flights to Vegas in two weeks—just before New Year’s Eve—aren’t great, either, So I’m open to suggestions. Waiting to go to a holiday party, I played an Ignition Casino NLHE Jackpot Sit-n-Go, got a 5x payout, and won it on a hand where both the shorter stacks shoved when I had kings. Played a satellite for the Ignition Casino 12 Days of Turbo Wrap Up #61 NLHE and only got 20th place, the jumped into the game directly. I lost some ground early on with a series of pairs that didn’t go anywhere (although I could see from the rabbit cam feature that the pair of sevens I folded on the flop with two overs would have made a set on the turn, grrrr…). I got ground down to 6K from the 15K start relatively early, then picked up a couple thousand before the first break. It being a turbo, I was getting down into the Danger Zone, when I picked up AxQx in early position and jammed about 12bb. A middle position player with 40bb called with AxTx there was a ten in the door and I was out. Played two $2 NLHE Jackpot Sit-N-Gos and busted third on the first. 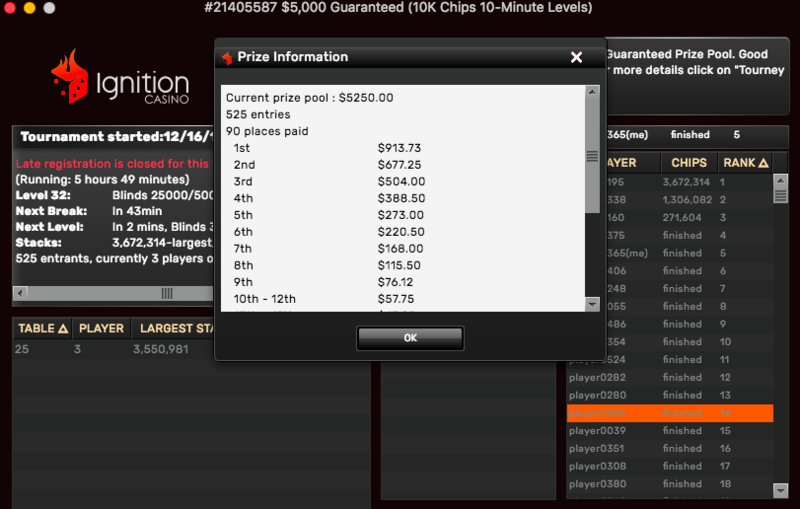 The second was a $10 payout, I got down to 15bb early on, then came back and won it. Sixteen years ago today I nearly died from a pulmonary embolism (PE), technically a bunch of them, from multiple blood clots that formed in my leg after I broke it making their way to my lungs two months to the day after my fall. Nothing quite like this, but this guy definitely had clots in his lungs. My mother died four years ago from a pulmonary embolism, completely unexpectedly, without breaking anything. Fifteen years ago, there was a spate of stories about something called economy-class syndrome, which was basically people getting pulmonary embolisms on plane flights just from sitting in cramped quarters without moving their legs for hours. That’s all it takes. Sudden shortness of breath, coughing, and related issues may be all you get. And medical personnel aren’t always on top of it: I had literally called the advice nurse the day I had mine because I was feeling unexpectedly winded after moving from crutches to a cane; my mother was getting ready to go to a doctor’s appointment she’d made after complaining she had trouble breathing at her ophthalmologist’s office when she died. And she knew I’d had a PE. None of us even thought of it until the autopsy. We poker players tend to sit around a lot. But take this as a gentle public service announcement: Get up and move around.